Sylvia is tired of living her life under her drunk uncles thumb and wants to find a way out of her miserable existence. One afternoon good fortune falls into her lap when she sees a notice posted for passage paid bond servants. She is sorely tempted to run away to the new colonies and seek a better life, but can she do it? She has nothing left in London besides her drunken uncle, but if she leaves she won’t even have that. 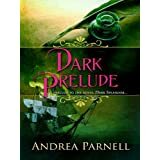 Dark Prelude is a great intro for Dark Splendor, it makes the reader want more.